Frances only had one thing on her mind – study and make it into one of the UK’s elite schools. But when she finds out her friend Aled is the mysterious voice behind her all-time favourite podcast she finds a new sort of friendship in Aled and Universe City. But when it goes viral everything comes crashing down, and Frances has to confront her past. 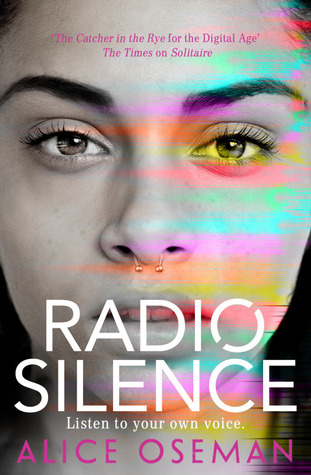 I really enjoyed Radio Silence. Although I do tend to stray away from YA novels that attempt to mix in fandom into its plot because I often find it doesn’t use fandom as well as it could. But I really enjoyed how Alice used fandom to show the beauty and danger of the internet while creating a stable novel about choices, and whichever path you take doesn’t matter, so long as you decide the course of your future. Frances’ experiences felt so true to me, as someone who is currently in the position she’s in- the transition from college to university is scary. Frances has such a significant character development- from a quiet girl who doesn’t feel comfortable about talking what she likes to openly enjoy all the strange things she thought people would judge her for.